Remember Hope is a visual documentary of President Obama’s historic victory on November 4, 2008, as seen through the eyes of the voters and citizens. I worked on this with Ian Boyle as a Public Service Bureau project. We, like many others, found ourselves out in the streets celebrating in Fort Greene, Brooklyn, while the elections results were pouring in. Looking back, it was such a unique experience—to see so many people genuinely moved (often to the point of tears) over an election, not only of the first U.S. president with African-American heritage, but a president who, at 47, was the emerging voice of a younger generation. Our generation. It was as close to a political revolution as any of us had experienced. As the campaign poetry faded and the policymaking set in, we felt the nation as a whole—even staunch Obama supporters—had moved on and lost sight of how significant a moment this election victory was—in historical, political, and cultural contexts. 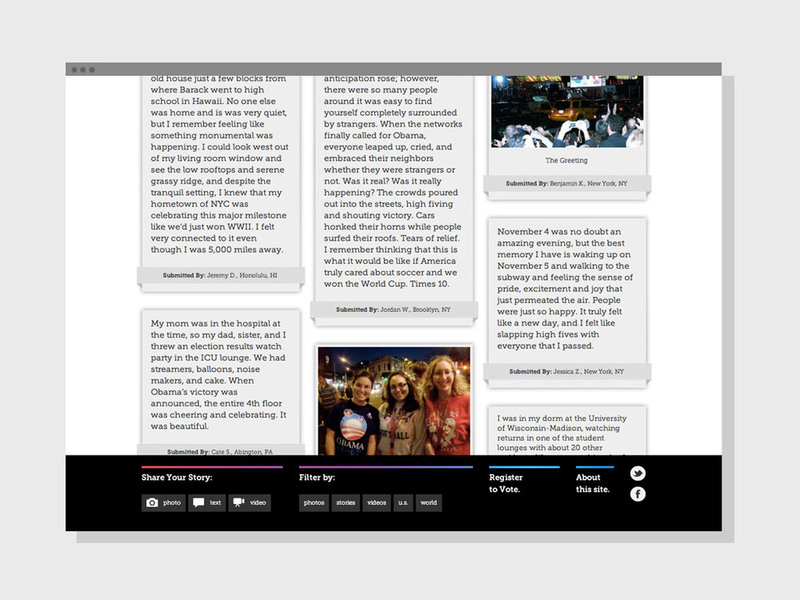 We set out to create a living archive that reminded people what that night felt like, and launched Rememberhope.com just before the 2010 midterms. 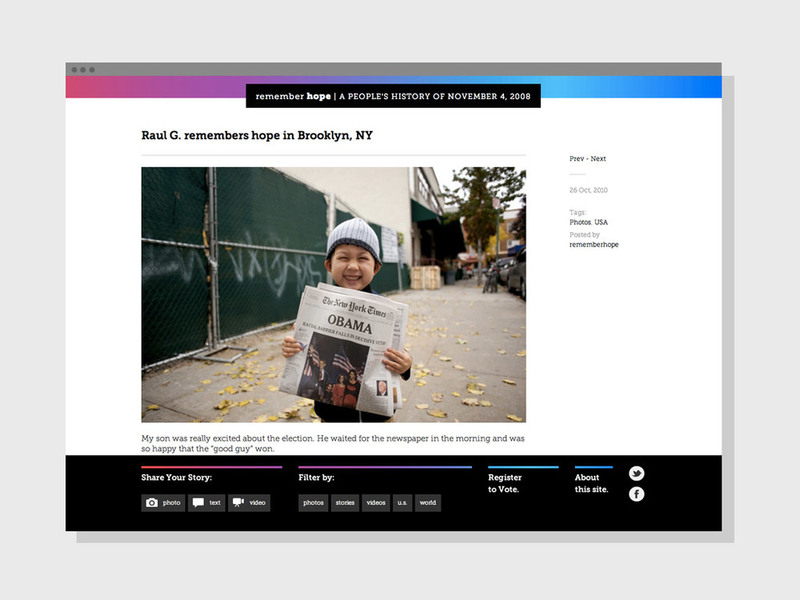 A retrofitted tumblr site, we invited contributors to submit a photo, video, or written stories of their memory from that night. The site is sortable by content type (photo, video, story) and location (U.S. or international entries). From Chicago to Turkmenistan, we gathered a virtual patchwork of shared experiences, all united by their spirit of positivity and hope.